·Details of coming DST EVENTS- Days of Renewal and Fatima Challenge!! ·Other events of interest – Residential Weekend, St Davids Cathedral Fellowship, Hereford Conference and a lot more. 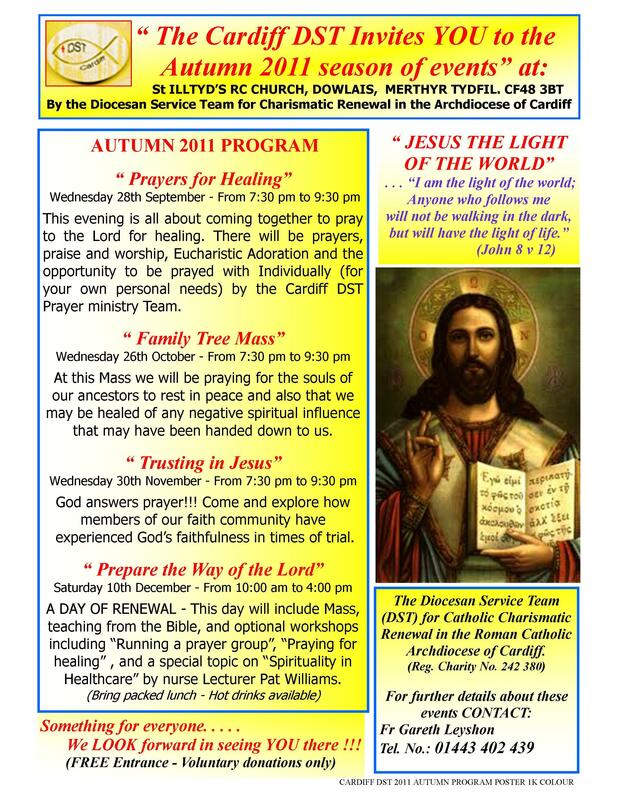 The DST's autumn programme runs on the last Wednesday of each month at St Illtyd’s, Dowlais CF48 3BT (7.30 – 9.30 pm) continuing with a Mass for members of our family treeon October 26th. > The Dowlais programme culminates in a Day of Renewal on Saturday 10th December with workshops on topics including "Praying for healing", "How to run a prayer group", and a special interest topic on "Spirituality in healthcare" by nursing lecturer Pat Williams. Devotions 10 a.m. until just after 12 noon on the First Saturday of each month at St Dyfrig’s Church, Treforest (CF37 1DB), in response to the invitation of Our Lady at Fatima. Includes Mass (10 am), opportunity for confession, rosary, meditation, and a time of shared prayer in which personal prayer intentions will also be offered in front of the Blessed Sacrament. Further info: Tony Fodor 0789 125 3133 (Mob) or Rev Gareth Leyshon 01443 402439. If you are not familiar with the story of Fatima, come to a film evening exploring the Miracle of Fatima, 7.30 pm on Thursday 6th October at St Dyfrig’s Parish Hall. NSC Wales- National Service Charismatic Team & Celebrate Wales. Those who are interested in receiving the monthly newsletter please write subscribe and contact our newsletter team. Wherever you live in (or near) the Archdiocese, and whatever your preferred kind of event, there will be something for you this autumn season. Thanks and blessings to each one of you.